It’s been 3 years since the design was presented and now, finally, we’re going to see groundbreaking. Supporters are currently the main sponsor of Bosnia’s crucial football project. 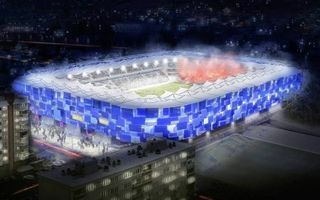 Until April 10 the Bosnian league powerhouse Željezničar is awaiting for bids in Stadion Grbavica reconstruction tender. By the end of April demolition of the east stand should begin, marking the first phase of complete stadium revamp. Within the first stage one single tier of the east stand will be built, expected for opening by the end of 2016. Afterwards, identical second tier will be added to it, along with roof and outer cladding. Throughout the works Željezničar will follow the design commissioned by Novo Sarajevo in 2013. In 2017 the stadium won’t only see the east stand complete, but also the newly-built south end. Currently it’s a dated landfill curve, while by 2018 it’s going to be a robust football-type stand built just behind the end lines of the field. Interestingly, Željo are planning to launch the project without public funding. In early stages they will rely on own resources and supporter crowdfunding. In an impressive first period of 12 days fans of Bosnia’s most popular club raised BAM 74,350 (or $42,400) to aid the cause of a “European Grbavica”. In the future, to deliver the whole 20,000-capacity arena, it might not be possible without public support. That’s why already now the club applied for funding within the Novo Sarajevo commune, the municipal and regional authorities, as well as on ministerial level.